Like the cozy tavern of Wayfarer's Rest here is a warm welcome to lively adventurers and weary travelers from near & far. While the blog is a great tool for keeping everyone up-to-date on the latest happenings those posts tend to get buried after a while. Think of these 'message boards' as a more permanent place for tips, advice and other help on Making and Playing the game. The easiest way to ask a question is to send a message using the Contact form. When the answer is something that might be useful to everyone a new topic will appear under the appropriate heading. ...Or, did you come here to support the project? A collection of upcoming changes for ruleset 1.2 that have been revealed in bits and pieces on the blog. it's set up to be printed out as a front-to-back booklet. For those just poking around or trying to understand more about the game this 'specially formatted' version may be of interest. The content is the same as the version found in the PDF Packs, except in this case the entire document can be read cover to cover - as a single PDF document. Sometimes a player group will reach the point where they pretty much know all the ins-and-outs of the game, from setting up for an adventure all the way through to the Victory phase. After this they may find themselves needing only to reference on occasion some of the more esoteric rules and figures. This is where a Quick Reference guide might come in handy. Thanks to the considerate work of Mary Lightheart (who was kind enough to share this with us) we have a fine example that offers an excellent reference point for anyone thinking about creating one of their own. The sample guide below was originally created for ruleset version 1.0.7 but should still provide a good starting point. 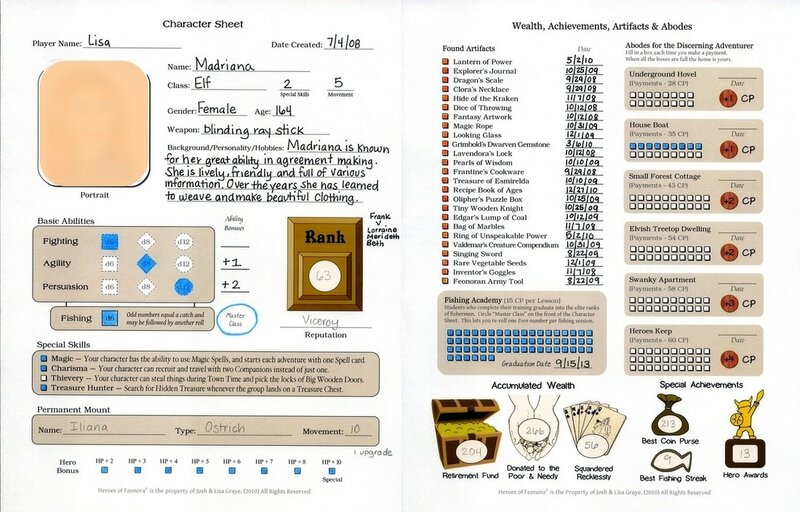 When it comes to printing out the card decks there are two PDF print settings that cannot be understated. The first is Page Scaling, which ideally should always be disabled or set to "None." The other is paper (or media) thickness, which when printing to thick paper should properly be set to "Thickest" (or equivalent) in the printer properties settings. An attempt at more detailed instructions are included in the Read Me First text file. in most cases, assist in producing higher quality card decks... symmetrical size, smoother color, slightly larger cards. Printing tip: If you are able to get a hold of some quality paper for the card decks, we have had success taking the paper and pdf files over to the local office supply print center. See if they have a color Xerox printer behind the counter and find someone who can help you print out the decks using one of these high-end machines. Cost per deck seems to range from around $9 to $15 but looks great with the right paper. Be sure to use the "Actual Size" setting. The official components list can be found on the last page of the 'Story Cards' pdf file. What you'll notice is that the number of Fish Tokens listed is 48. Yet, when the Fish Tokens pdf file is opened it quickly becomes apparent that there are only 35 fish tokens (the greatest number we could fit on a single sheet). This is easily overcome by printing two sheets, giving 70 total fish tokens and plenty of leftovers. It should be understood however that the original number (48) is the intended quantity of fish for each adventure. Without going into too much detail there are several game balance and mechanical reasons for why this number has been set. Just know that the extra 22 fish tokens from the second sheet really should be set aside rather than placed into the stack. They are not meant to be available for when the cart runs out of fish. One exception to this might be a scenario in which the group wanted to add an extra player. In the case of a seventh player for example, it would be appropriate to add an additional 8 fish tokens to the stack... but no more than that. In all other cases, Ned's fish cart should contain 48 fish for each game involving one to six players. ...another way to fill out a Character Sheet using a combination of ink and colored pencil. Years ago, during the very early stages of concept development, we were looking into methods of coin cleaning. It quickly became apparent that there wasn't a consensus on how best to do this. After doing a bit of traveling, observation and note-taking we came up with the following 'recipes' for coin cleaning. Perhaps the moral of the story is that coins can be cleaned in myriad ways...try to find what works for you. Which is the best you say? We're not sure (but suspect that a reclusive old Wine Merchant named Wregan Fedoralmynt secretly possesses the answer). Elvish Method - Prepare a work surface: usually a table, mushroom or tree stump overlaid with Aloevian leaves for proper absorption and drying. Carefully rub each coin with Olive oil, applying just enough (but not too much) pressure. Do not spill the oil for it is difficult to acquire and needed for other, more important purposes. Regardless of what the others say this is the most proper method as it does not make them too shiny, yet still effectively removes the majority of dirt and other blemishes. Malornian Method - If you want your coins shiny and bright (as they should be) use metal cleaner. Usually the Dwarves have this, but they never use it for cleaning coins (In fact, we don't know what they use it for). But use it sparingly, and younglings should not be near the cleaning substance or the coins. Even after cleaning coins may tarnish, so you will have to be diligent. Dwarvish Method - "What in Griffin's name do you want to clean coins for? Next thing you'll be wanting to know how to clean underwear!!" (Uproarious laughter and finger pointing ensues, followed by displays of strangely disfigured gems, which quickly erupts into a bragging contest that soon devolves into fisticuffs). We're moving on. Khajathi Method - Soak the coins in White vinegar. Yes, that is the secret ingredient. Then, rinse them off in a combination of water with a little baking soda (the Hauflins usually have some of this) to neutralize the acid from the vinegar. Lastly, a final rinse using plain well water. Place on cloth or leather to dry. You might also take another cloth and pat them the rest of the way to get them good and dry. coins to remove crud. Rinse thoroughly. If you find a badly crusted coin (common when trading with Dwarves) we recommend using a mixture of sand, laundry detergent and water in a tumbler (for example, a one quart jar). Shake and let set for at least two days. "That will be ten Copper Pieces." The Hauflin Method - "Oh coins are nice sure, but we prefer to trade in goods. After all, you can't plant or harvest coins and, thanks to the experiments of Dauber the toothless, we know they make a terrible ingredient for Steamy Potato soup. If you want to end up with more coins it's better to trade with Khajathi. They are fair, even more fair than the Human merchants. Trading with Dwarves usually ends up with fewer coins and they are sometimes made of wood, which the Humans won't accept and usually blame us...then they get angry and...What were we talking about?" Pennyblum's Method - Place your coins into a clean jar of white vinegar and salt. Gently shake the contents and leave it overnight. The mixture will do the trick. -- "You're welcome." The Goblin Method - "Eat dirty coins. They come back to you only more better. Like this!" The Orcish Method - "Pick up Hauflin, turn him upside-down, watch shiny coins fall onto ground as little Human makes funny noises. Toss Hauflin and take shiny coins." Improvements to the game experience are influenced by feedback from the player community. The Question: "Okay so, how important is seating arrangement?" It comes into play during Town Time, and partly why a Group Leader is chosen (automatically) for each adventure. Otherwise, position and turn order should not be viewed as critical to the outcome of the game. There may come a time when an experienced player will bring a power-leveled character to the table, in other words, a character with much higher Rank, Movement, Hero Awards and other bonuses compared to the other characters. In this situation that player should probably be positioned at the end of the rotation. It isn't a requirement, but does fall more in line with the spirit of the game. Moderate differences from one character to another are very much a normal aspect of things. Overall, keep to the Setup checklist and try not to get too caught up in seating arrangement around the board. An experienced player (with a high-level character) is meant to understand 'the code' and should rarely complain about taking a position at the end of the rotation, to control the Town Timer and set an example for the other players. Games can be just as fun, and take on a unique twist, when players control more than one character. In fact, in much of the playtesting Lisa and I have done together we've enjoying playing (and roleplaying) multiple characters. When playing multiple characters, do try to remain objective and fair during the Victory Phase, especially during the Bargaining Round and voting for most Outstanding Roleplayer badge. One way to keep things fresh is to remove the Story Card that was played in the previous game - before a card is chosen by the Group Leader. Doing this allows for the Story to still be chosen at random, while also ensuring that the Adventure is one not recently played. When you include set-up and character creation the average game time can extend to three and a half hours or more. But this doesn't have to be the sort of game played only on the weekends. We've found that a single full adventure can be broken into distinct play sessions without disrupting the flow of the game. For example, imagine it's a week night. You only have an hour or two available for game time. This is going to be play session one. Tonight is going to be all about setting up the game, getting our Characters ready and playing through the Town Time phase. Once the Town Timer reaches the Group space we find ourselves at a good break point. Tomorrow night is play session two. We can pick up right were we left off, as the group is just about to set off on their journey - the Adventure phase. Assuming the group makes it to (and survives) the Final Encounter, play session two is all about making your way through the Adventure phase and then playing through the Victory phase (one of our favorite parts of the game). The Question: "Why can't we destroy that pesky Statue of Riddles, or at least run away from it?" Running away would only cause it to spring its trap. You could destroy it, with the right spell, which you don't have, except that doing so would only increase its power... so in actuality it cannot be destroyed in the way you're thinking. Probably best to try and solve the riddle. The Question: "If Dwarves are natural Treasure Hunters then shouldn't they have a higher Ransom Rating?" Ask a Dwarf and they will very likely make the same argument. But what the greater population of Feonora already knows is that while Dwarves may be good at acquiring loot & treasure they tend to be not so good at holding on to it. Bad guys usually take this into consideration when determining whether it would be worth the effort to relieve a Dwarf of his or her coin purse. The Question: "During the Diplomacy Final Encounter, why doesn't the End Boss accept the Influence Boost payment and agree to whatever our side is trying to do?" You'd think it would work just this way with some personalities but apparently not with the characters in question. We can't say for sure what reasons your adversary might have but tend to think it would make things much too easy, and less fun. A good victory is one gained through strategic effort (and on occasion, a bit of guile). Bob of the Briarthick Wood has asked: whether a character might be able to raid (I mean "utilize") their Retirement Fund in the quest for a Permanent Mount, or to make a down-payment on an Abode. Since this was addressed in a later version of the Victory phase manual some clarification on Accumulated Wealth may be in order. Once a Character has placed money into their Retirement Fund it cannot be used during any portion of the game or the Victory phase. It is there, one might say, as a badge of honor - or humility depending on what sort of character we're talking about. In short, a Character's Retirement Fund is purely symbolic. There the accumulated wealth must remain, as a monument to: in the words of Villageton's Bank President Mr. Hogglebottom, "...prudence!, Rrrrrresponsibility and good fiscal accountably, accountably, accountibible...ah hem, Management." The Question: "Why is it so hard to reach Master Class!? Like I'm so sure." Fishing is a common skill among the various inhabitants of Feonora. Expertise at the "Master Class" level however is another matter entirely. To truly master the art of fishing takes determination, dedication and many years of honing a kind of extra-perceptory sense. Many will try; few will ever reach the goal. The Question: "I never got the chance to use this Butterfly Jar during the Adventure. Can it carry over to the Victory phase?" Hmm; let's have a look. The instructions for the Cleanup portion of the Victory phase seem pretty clear: Item cards [that are not Artifacts] are to be turned in. This is a sound rule and so, unfortunately the answer must be no. But perhaps the greater matter concerns any resulting Butterfly competition, which it may well be argued should be somewhat more about Agility. Or, as a sporting giant once said, "skill versus skill alone." Mergatroyd of Worcestershire writes, "Hello, a friend wanted me to ask. During the Victory Phase is it allowed for a player to not take part in the butterfly catching competition?" Ah. This is the competition that takes place in the Tavern between all players who are tied with the most butterflies. And the question is about whether players are permitted to abstain from the competition (for in some cases they may not be in the running for the Hero Award so why bother right?). But alas, even if the Hero Award is not within grasp for this character the implications of not participating could sway the outcome for those in the running (also known as the "Kingmaker" conundrum). In the spirit of the Victory Phase, which is not only about winning the Hero Award but also about earning Badges for prestige and honor, players should (and if it comes down to it must) participate in the butterfly collecting competition. This way, the character is showing good sportsmanship and giving the Tavern patrons a better show - they like that a lot. Thanks for the question Mergatroyd.